How do you make a crowdfunding campaign succeed? How do you make a crowd funding campaign succeed for your vision? 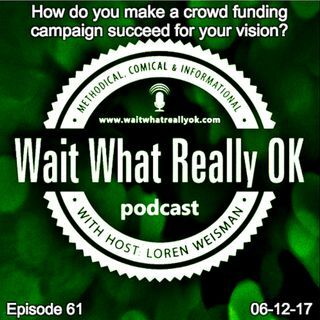 Wait What Really OK Podcast Episode 62 hosted by Brand Precision Marketing Strategist and Counselor, Loren Weisman talks about crowd funding and the considerations to keep in place when starting a campaign. Setting up an effective crowdfunding campaign takes planning with a focus on the perception and marketing of that campaign. All too often people jump the gun, do not prepare and forget to strategize the plan. How do ... Más informaciones you make a crowd funding campaign succeed? By planning it out from the right budget to the right rewards and keeping in mind the three audiences you need to engage. It goes well beyond a donation and it is key to keep those that donated engaged. If you need help planning and strategizing a crowd funding campaign, feel free to connect with me at any of the links below. Let's discuss the best plan of action to bring your vision to life. Ep 61 “How do you make a crowdfunding campaign succeed for your vision?” of the Wait What Really OK Podcast is available on iHeartRadio. Podcast Blog Supplement for Episode 61 of the Wait What Really OK Podcast with Loren Weisman. Podcast Link Supplement for Episode 61 of the Wait What Really OK Podcast with Loren Weisman. What are the tax issues surrounding crowd funding campaigns? Podcast Video Supplement for Episode 61 of the Wait What Really OK Podcast with Loren Weisman. Podcast Photo Supplement for Episode 61 of the Wait What Really OK Podcast with Loren Weisman.